SOURCE: University of Wisconsin-Madison A colony of undifferentiated human embryonic stem cells. This article contains a clarification that updates information from last week. An expert panel at Stanford University has determined that nearly one quarter of the colonies of human embryonic stem cells that the Bush administration had approved as ethically derived and eligible for study with federal funds do not meet Stanford’s ethics standards and should no longer be available to researchers there. The decision is the first of what is expected to become a string of such moves following the publication in May of a little-noticed report by a University of Wisconsin professor who found serious ethics lapses in the way some of the Bush-approved cells were obtained from embryo donors. Johns Hopkins University has quietly come to a decision similar to Stanford’s, and will undertake case-by-case assessments of the appropriateness of using various cell lines. And at least two University of California campuses, as well as the University of Wisconsin and California’s state-wide stem cell consortium are currently considering similar moves. 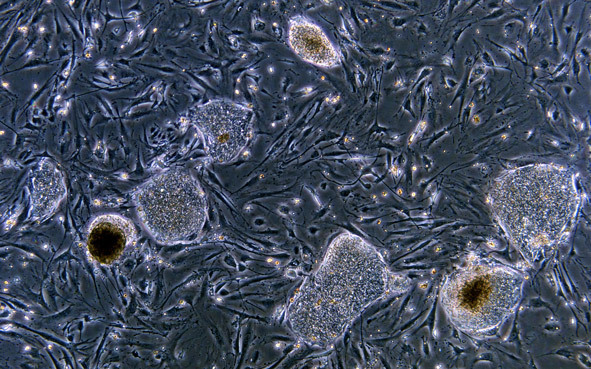 The revelations bolster a growing sense among researchers, the public, and representatives on Capitol Hill that the Bush stem cell policy is untenable and in need of a major overhaul. Bush’s policy, announced by the president on August 9, 2001, determines which colonies, or “lines,” of stem cells can be studied with taxpayer dollars—not on the basis of whether those cells were obtained by ethical means but simply on the basis of when they were derived. It says cells that were derived before August 9, 2001 can be studied with federal monies and those derived later cannot. When Bush announced the policy in 2001, it was touted by administration officials as a moral triumph and a Solomonic compromise between those who flatly opposed the research and those who wanted unfettered funding for research on the cells. The Wisconsin investigation found otherwise. The administration was adamant that as many cell lines as possible that were derived before the August 9, 2001 deadline be included on the approved list…in the hope that scientists would be mollified. For some of the Bush-approved cell lines, the Wisconsin report found, consent forms that women signed as they donated their embryos for research promised that cells from the embryos would be used for a single, narrowly defined experiment and then destroyed. But stem cell research is not done this way. The whole point is to grow the cells into tissues for research and possible medical use. And in fact, the cells in question have been kept alive and reproduced repeatedly and distributed to scientists around the world for an apparently unlimited array of stem cell experiments. For other Bush-approved lines, the informed consent form used by researchers to gain access to fertility patient’s embryos was not a consent form for research at all, but rather was a standard medical consent form to begin fertility treatments. Only one vague sentence toward the end of the several-page form mentions the possibility that cells from some of the women’s embryos might be used for research. By contrast, widely accepted standards of informed consent require a full accounting of what kind of experiments will be done and what the various risks and benefits of participation may be. The Bush policy ignored these standards. The revelation that many of the Bush-approved cells were obtained without proper informed consent is but the latest evidence that there is less to the Bush plan than meets the eye. When the president announced his long-awaited policy on funding of human embryonic stem cell research on August 9, 2001—in his first televised address to the nation after being elected—he said there were more than 60 lines of cells that qualified under his plan, plenty for scientists to work with. As it turned out, the number was actually 21. Then it came out that all those lines that were eligible and available had been cultivated with mouse cells and were potentially contaminated with mouse viruses, seriously diminishing their value as therapeutic tools. And more recently it has become clear that some of these older lines have begun to accumulate genetic mutations. Meanwhile, researchers around the world have developed hundreds of new embryonic stem cell lines using scientifically and ethically superior methods, but none of them are available to researchers using federal funds because the Bush plan is all about when instead of what. Made aware of the informed consent lapses, a special stem cell ethics committee at Stanford recently concluded that all five human embryonic stem cell lines derived by two companies—Celartis of Sweden and BresaGen of Athens, Georgia—did not meet widely accepted ethics standards. That means the number of lines now available to federally funded scientists has shrunk at Stanford to just 16. Stanford officials said they are discussing whether to implement the committee’s recommendations. Those recommendations came about as a result of research by Robert Streiffer, a professor of bioethics and philosophy at the University of Wisconsin at Madison. Streiffer used the Freedom of Information Act to examine the informed consent forms used by all the various research groups whose cells eventually passed muster with Bush. The Celartis and BresaGen forms were in gross violation of federal and international ethics standards, Streiffer said. The others, while imperfect, he deemed acceptable and he encouraged ongoing use of those cells in research. In addition to the form not going into any detail about what kind of research might be done, Streiffer said—a basic requirement of any consent form—the forms are deceptive because there are no accepted tests for whether an embryo in a lab dish is, in fact, developing or alive. “This probably does not count as informed consent for research at all,” Streiffer said of the BresaGen form in his published analysis, which appeared in the May/June issue of the Hastings Center Report, a journal of bioethics. A representative of Celartis said he could not comment on the issue, and BresaGen did not respond to a query from Science Progress. In an interview, Streiffer expressed surprise that the National Institutes of Health accepted the BresaGen and Celartis lines as eligible for federal funding, given the obvious lapses in the quality of their informed consent. But NIH insiders, speaking on condition of anonymity, said they had little choice at the time. The administration was adamant that as many cell lines as possible that were derived before the August 9, 2001 deadline be included on the approved list, NIH sources said, in the hope that scientists would be mollified. “We essentially had a gun held to our heads,” one insider said. It is not clear how many experiments in the United States or abroad may be affected by the new restrictions. At least one experiment had been approved at Stanford using one of the lines, and will now be halted before it begins. Federal documents indicate that at least 90 shipments of cells from the two companies have been sent to researchers since they were first made available. The new recognition that the Bush cells don’t really inhabit any particular moral high ground could change the dynamics of the stem cell debate going into the election. There has been growing suspense in scientific and political circles as to whether the Republican presidential contender, Sen. John McCain of Arizona, will maintain his support for legislation that would loosen the Bush restrictions. McCain twice voted for bills that would have done so, but has recently been rumored to be considering a reversal given a perceived need to solidify support from what remains of Bush’s conservative base. Streiffer said it makes no ethical or scientific sense to base a policy on the timing of when cells were derived, as opposed to how they were derived. There have been many technical improvements, he noted, that make more recently derived cells more scientifically useful. In addition, newer lines have largely been derived with the benefit of new ethics guidelines that in recent years have been promulgated by the National Academies and other groups. “Bush’s policy is getting in the way of us doing it better, scientifically, and ethically,” Streiffer said. * Update, July 28, 2008: This article indicated that Johns Hopkins University has come to a similar decision to Stanford’s. It has been updated to indicate that Hopkins will undertake case-by-case assessments of the appropriateness of using various cell lines. Other changes reflect Stanford’s ongoing review of its committee’s recommendations. This article contains a clarification that updates information from last week. An expert panel at Stanford University has determined that nearly one quarter of the colonies of human embryonic stem cells that the Bush administration had approved as ethically derived and eligible for study with federal funds do not meet Stanford's ethics standards and should no longer be available to researchers there. The decision is the first of what is expected to become a string of such moves following the publication in May of a little-noticed report by a University of Wisconsin professor who found serious ethics lapses in the way some of the Bush-approved cells were obtained from embryo donors. Johns Hopkins University has quietly come to a decision similar to Stanford's, and will undertake case-by-case assessments of the appropriateness of using various cell lines. And at least two University of California campuses, as well as the University of Wisconsin and California's state-wide stem cell consortium are currently considering similar moves. The revelations bolster a growing sense among researchers, the public, and representatives on Capitol Hill that the Bush stem cell policy is untenable and in need of a major overhaul. Bush’s policy, announced by the president on August 9, 2001, determines which colonies, or “lines,” of stem cells can be studied with taxpayer dollars—not on the basis of whether those cells were obtained by ethical means but simply on the basis of when they were derived. It says cells that were derived before August 9, 2001 can be studied with federal monies and those derived later cannot. When Bush announced the policy in 2001, it was touted by administration officials as a moral triumph and a Solomonic compromise between those who flatly opposed the research and those who wanted unfettered funding for research on the cells. The Wisconsin investigation found otherwise. The administration was adamant that as many cell lines as possible that were derived before the August 9, 2001 deadline be included on the approved list...in the hope that scientists would be mollified. For some of the Bush-approved cell lines, the Wisconsin report found, consent forms that women signed as they donated their embryos for research promised that cells from the embryos would be used for a single, narrowly defined experiment and then destroyed. But stem cell research is not done this way. The whole point is to grow the cells into tissues for research and possible medical use. And in fact, the cells in question have been kept alive and reproduced repeatedly and distributed to scientists around the world for an apparently unlimited array of stem cell experiments. For other Bush-approved lines, the informed consent form used by researchers to gain access to fertility patient’s embryos was not a consent form for research at all, but rather was a standard medical consent form to begin fertility treatments. Only one vague sentence toward the end of the several-page form mentions the possibility that cells from some of the women’s embryos might be used for research. By contrast, widely accepted standards of informed consent require a full accounting of what kind of experiments will be done and what the various risks and benefits of participation may be. The Bush policy ignored these standards. The revelation that many of the Bush-approved cells were obtained without proper informed consent is but the latest evidence that there is less to the Bush plan than meets the eye. When the president announced his long-awaited policy on funding of human embryonic stem cell research on August 9, 2001—in his first televised address to the nation after being elected—he said there were more than 60 lines of cells that qualified under his plan, plenty for scientists to work with. As it turned out, the number was actually 21. Then it came out that all those lines that were eligible and available had been cultivated with mouse cells and were potentially contaminated with mouse viruses, seriously diminishing their value as therapeutic tools. And more recently it has become clear that some of these older lines have begun to accumulate genetic mutations. Meanwhile, researchers around the world have developed hundreds of new embryonic stem cell lines using scientifically and ethically superior methods, but none of them are available to researchers using federal funds because the Bush plan is all about when instead of what. Made aware of the informed consent lapses, a special stem cell ethics committee at Stanford recently concluded that all five human embryonic stem cell lines derived by two companies—Celartis of Sweden and BresaGen of Athens, Georgia—did not meet widely accepted ethics standards. That means the number of lines now available to federally funded scientists has shrunk at Stanford to just 16. Stanford officials said they are discussing whether to implement the committee's recommendations. Those recommendations came about as a result of research by Robert Streiffer, a professor of bioethics and philosophy at the University of Wisconsin at Madison. Streiffer used the Freedom of Information Act to examine the informed consent forms used by all the various research groups whose cells eventually passed muster with Bush. The Celartis and BresaGen forms were in gross violation of federal and international ethics standards, Streiffer said. The others, while imperfect, he deemed acceptable and he encouraged ongoing use of those cells in research. The Celartis consent form told donors that the cells “will be destroyed” upon the conclusion of a single (undescribed) experiment, but no such restriction is actually in place for researchers who want to use those cells nor would such a restriction be practical, according to scientists. In the BresaGen forms, which women must sign if they want to get fertility treatments involving in vitro fertilization, the one sentence that mentions research says embryos created through the fertility treatments might be used for research if the embryos “are not developing or living.” In addition to the form not going into any detail about what kind of research might be done, Streiffer said—a basic requirement of any consent form—the forms are deceptive because there are no accepted tests for whether an embryo in a lab dish is, in fact, developing or alive. “This probably does not count as informed consent for research at all,” Streiffer said of the BresaGen form in his published analysis, which appeared in the May/June issue of the Hastings Center Report, a journal of bioethics. A representative of Celartis said he could not comment on the issue, and BresaGen did not respond to a query from Science Progress. In an interview, Streiffer expressed surprise that the National Institutes of Health accepted the BresaGen and Celartis lines as eligible for federal funding, given the obvious lapses in the quality of their informed consent. But NIH insiders, speaking on condition of anonymity, said they had little choice at the time. The administration was adamant that as many cell lines as possible that were derived before the August 9, 2001 deadline be included on the approved list, NIH sources said, in the hope that scientists would be mollified. “We essentially had a gun held to our heads,” one insider said. It is not clear how many experiments in the United States or abroad may be affected by the new restrictions. At least one experiment had been approved at Stanford using one of the lines, and will now be halted before it begins. Federal documents indicate that at least 90 shipments of cells from the two companies have been sent to researchers since they were first made available. The new recognition that the Bush cells don’t really inhabit any particular moral high ground could change the dynamics of the stem cell debate going into the election. There has been growing suspense in scientific and political circles as to whether the Republican presidential contender, Sen. John McCain of Arizona, will maintain his support for legislation that would loosen the Bush restrictions. McCain twice voted for bills that would have done so, but has recently been rumored to be considering a reversal given a perceived need to solidify support from what remains of Bush’s conservative base. Streiffer said it makes no ethical or scientific sense to base a policy on the timing of when cells were derived, as opposed to how they were derived. There have been many technical improvements, he noted, that make more recently derived cells more scientifically useful. In addition, newer lines have largely been derived with the benefit of new ethics guidelines that in recent years have been promulgated by the National Academies and other groups. “Bush’s policy is getting in the way of us doing it better, scientifically, and ethically,” Streiffer said. * Update, July 28, 2008: This article indicated that Johns Hopkins University has come to a similar decision to Stanford's. It has been updated to indicate that Hopkins will undertake case-by-case assessments of the appropriateness of using various cell lines. Other changes reflect Stanford's ongoing review of its committee's recommendations. Rick Weiss is a Senior Fellow at the Center for American Progress and Science Progress.